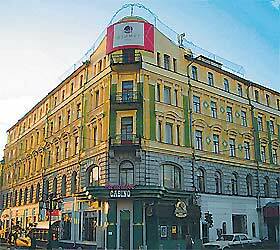 The Azimut Hotel Samara is located downtown, in the historical and cultural centre of the city at the intersection of Frunze and Leningradskaya Streets, 15 minutes away from the railway station and an 1.5 hour drive from Kurumoch airport. Close to the Hotel is one of the most beautiful places in the city, the quay of the Volga River, a favorite place of the citizens and city guests. The hotel offers 96 rooms of the following categories: Standard (single, double and family rooms), Comfort (double and family rooms), Business (single and double rooms with a double bed or twin beds to choose from), Apartment (double rooms with a large bed offering extra personal service). Rooms are equipped with everything needed for a comfortable stay: bathrooms with toiletry, satellite TV, direct telephone lines, hair-dryers. Every morning buffet breakfast is served for hotel guests. The Vinopiazza restaurant situated on the ground floor of the hotel offers Italian cuisine with its popular pasta and pizza. The hotel has 4 conference halls with capacity of 10 to 300 people fitted out with all necessary equipment for holding seminars and conferences. Three halls for carrying out festive occasions are also available. The conference equipment includes: LCD projector, laptop, slide projector, screen, flip chart, conference set (paper, pencils), conference coordinator's attendance and additional service at the clients' request. The Azimut Hotel Samara provides its guests with the following extra service: safes at reception, cash point, luggage room at the hotel lobby, bell-boy service, newspapers and magazines in English and Russian, 24-hour laundry and ironing services, concierge service (booking of air, railway, theatre and concert tickets, restaurant tables etc. ), Wi-Fi Internet access.